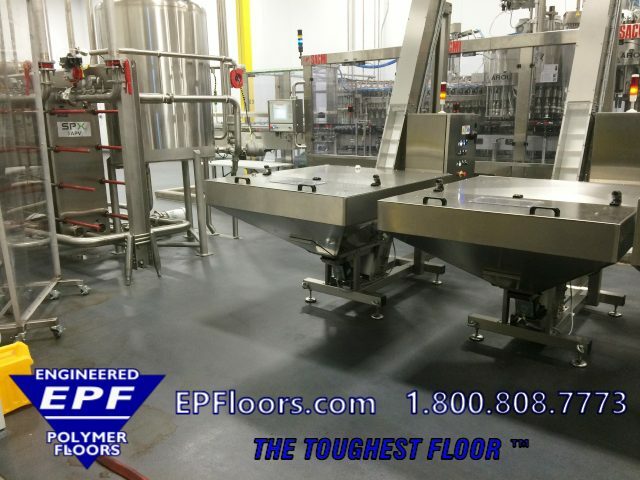 There are many different food processing floor options available in the marketplace. Epoxy and urethane systems are readily available. 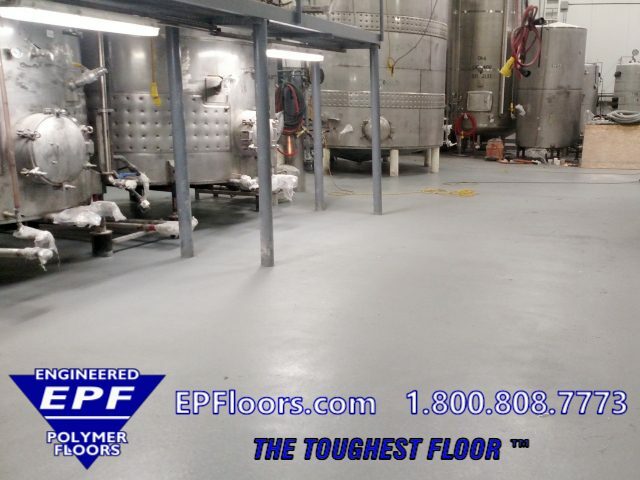 However, cementitious urethane floors are considered the modern standard for food safe flooring in processing facilities. Also known as urethane mortar flooring, or urethane concrete, bonds extremely well to difficult concrete floors in damp and cool conditions, where other systems won’t. 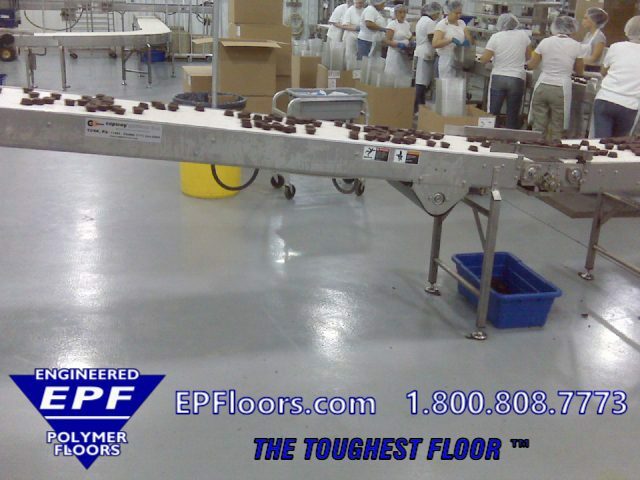 This food grade flooring tolerates wide temperature swings, with excellent chemical resistance. 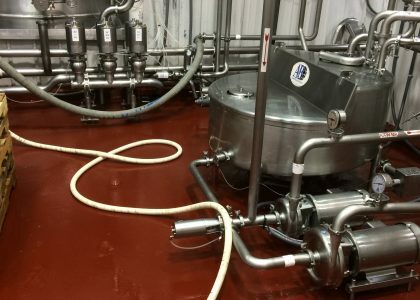 They are often considered the best of all worlds when it comes to choosing a industrial flooring product for the food processing industry. 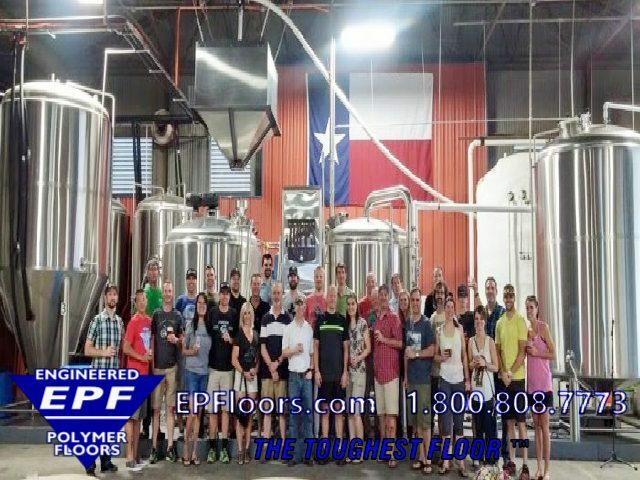 Seamless polymeric flooring can provide a highly slip resistant surface, with a low maintenance, highly durable surface. Overall, urethane concrete floors can be a cost effective option for production areas, warehouse, loading docks and maintenance areas. 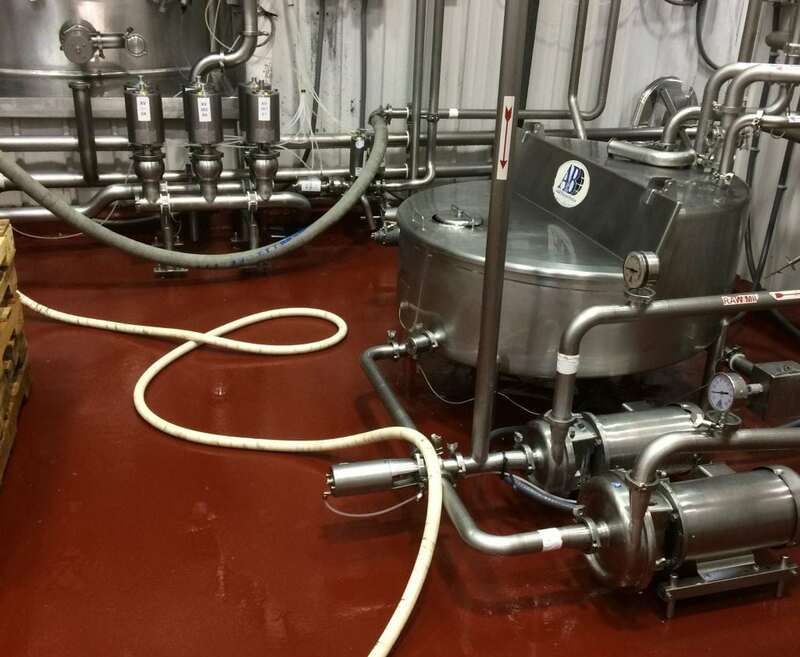 AntiMicrobial additives can also be added to the formulation to create a antimicrobial floor that combats bacteria in between washdown cycles. These floors may be applied over brick and tile, in certain situations. Installation is just as important as using the right materials. Most manufacturers simply sell the materials to a third party. 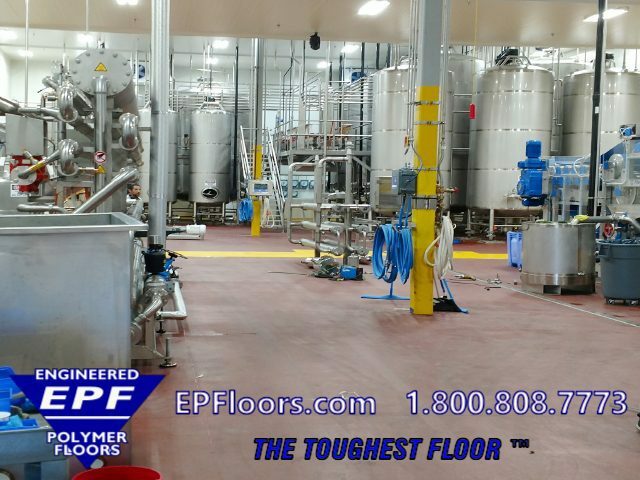 We recommend contacting a manufacturer such as E P Floors Corp., that is vertically integrated. 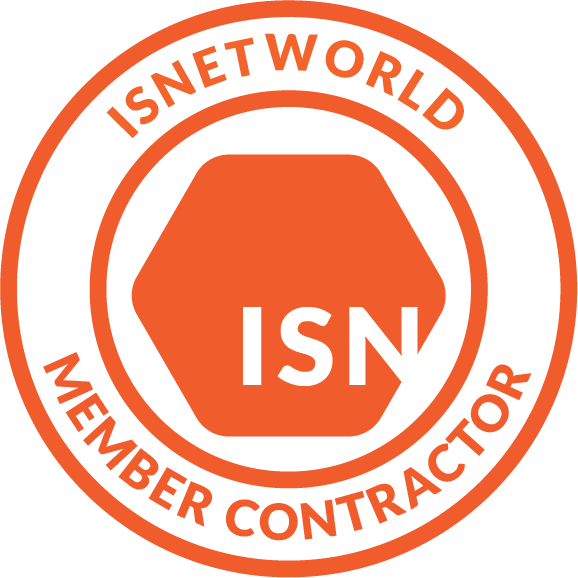 This type of company installs their systems with their own crews. This provides for an expert turn key installation and warranty. No “finger pointing”, if a repair issue develops. 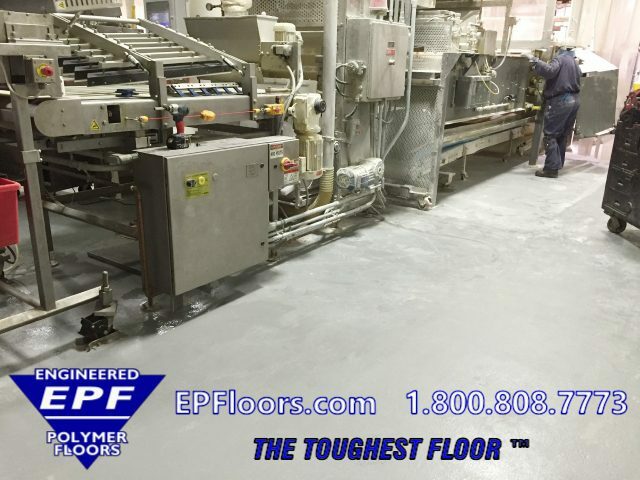 Epoxy flooring products were at one time (before urethane mortar floors were developed) were thought to be a good choice for food manufacturing floors. 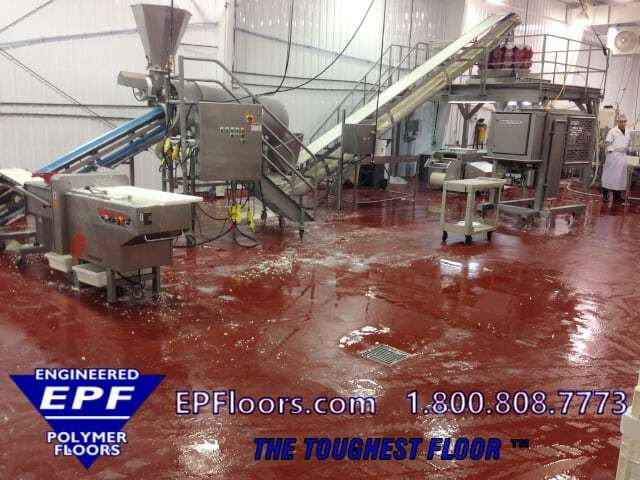 Unfortunately, lactic acid, damp and/or cold conditions & thermal shock, serve as an enemy of epoxy floors. Lactic acid is present in all food facilities as a byproduct of food decomposition. The lactic acid slowly creates “pits” in the floor surface when the surface becomes attacked by lactic acid, during normal wear and tear on the floor. The “pits” quickly degrade into holes, and spread like “cancer” as they expand and migrate throughout the floor. Hairline cracks develop in hot spill and washdown areas. This can cause breakage, and water/chemicals to seep under the floor. 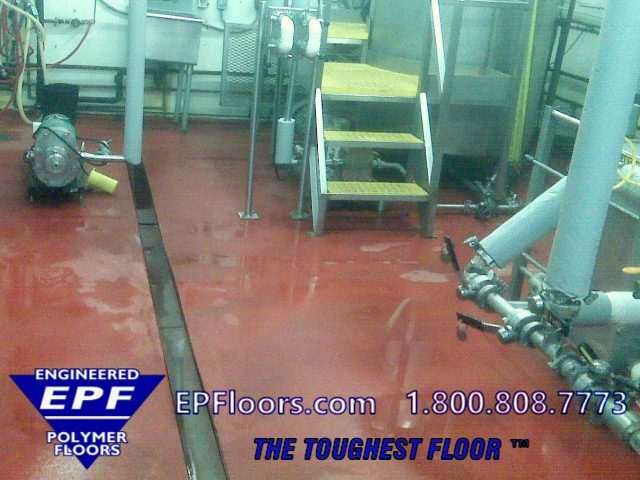 Within a relatively short period of time, the epoxy floor will need to be replaced. Due to this limited chemical resistance, thermal shock resistance, and limited moisture tolerance, epoxy has mostly gone by the wayside. Unfortunately, companies that only manufacture epoxy are still pushing these products in processing facilities. This material is an excellent food processing floor option, for operating freezers. If the flooring must be installed in a freezer during operation, MMA’s will cure down to -20 degrees fahrenheit. They are a good choice for crack repair and leveling in these very cold areas. However, due to temperature swings (thermal shock and thermal cycling) in washdown and production areas, MMA’s will tend to unbond and fail due to floor coating material expanding and contracting at different rate than the concrete. This material also has a noxious odor during cure, which can taint open food products. Materials are flammable, which requires additional care during handling. Vinyl ester is a material which is sometimes looked at, when reviewing food processing floor options. This material has been used in the food processing industry, due to its high tolerance of nitric acids. Unfortunately, vinyl esters are flammable materials, with a very noxious odor during the application. This often requires the installation crew to wear gas masks with forced air supply for breathing purposes. 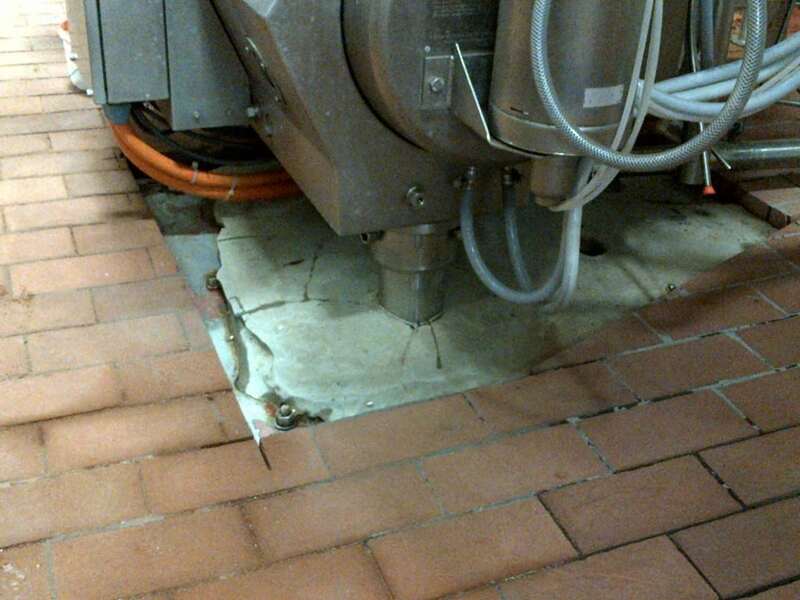 Repair of these floors is often a logistical challenge, that can only be due at plant shut downs, when no food is present, due to potential food product contamination. When looking at food processing floor options, dairy brick and quarry tile quickly come to mind. These are products that have widely been used in the food processing industry. At one time, these products were the only systems available (before the advent of seamless polymeric floors). These systems are only a viable choice for new construction or long production shutdowns. Drawbacks include the added thickness of these systems, along with a prolonged installation duration. These issues make brick and tile difficult or impossible for renovation and fast turnaround projects. Another issue with these systems is the grout lines between the bricks or tile. Grout can create harmful health effects if not cleaned properly. Harmful microbes,dirt, grease, stains and mold can accumulate in them. Sanitary flooring for clean rooms, RTE and ingredient areas must be seamless. Dirty grout lines often contribute to foul odors and deteriorating indoor air quality. Substances can penetrate the tiny grout pores, making sanitizing and thorough cleaning of the floor, extremely difficult. USDA approval, FSMA, SQF, and other certifications require a surface which is easy to clean and sanitize. Additionally, the grout joints have to be “re-pointed” regularly, to prevent moisture from passing into the spongy grout bed under the bricks or tile. Once the grout bed becomes saturated with moisture, it quickly spreads under the brick or tile, and eventually undermines the entire floor. If you have an existing brick/tile floor, and your grout joints are deteriorating, urethane flooring may be able to be applied over brick and tile, if it is done early in the deterioration process. Once the tiles and bricks become loose in large areas, the brick/tile must be completely removed. 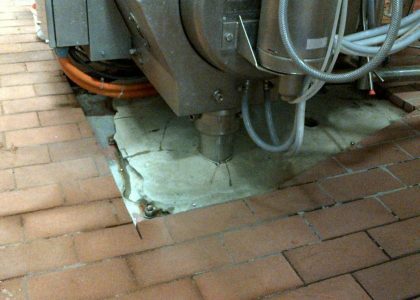 Brick and tile can be slippery when wet, or from ingredient spillage. Tiles may be brittle and sensitive to cracking from direct impact. However, on the plus side, individual tiles may be replaced. Brick and tiles can also resist thermal shock and thermal cycling in coolers, oven areas, and hot washdowns. 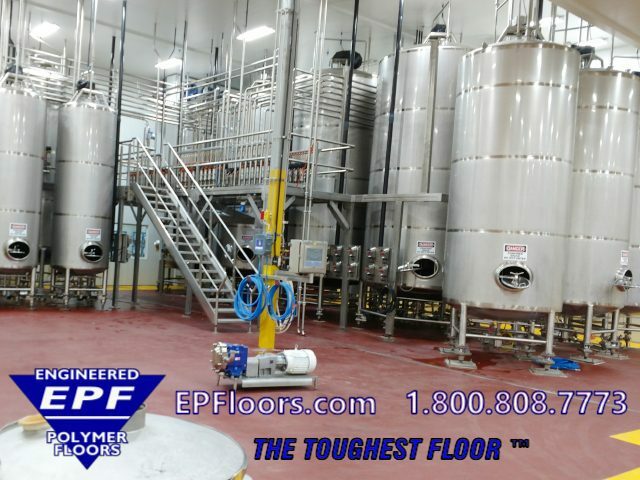 In summary, when comparing food processing floor options, one must be careful to evaluate the pros and cons of each. Each system has benefits, that may make it the right choice, in certain circumstances. Ensure that you are dealing directly with an applicator, since most of these companies listed in this article are manufacturers only. Check out the advantages over our competition !